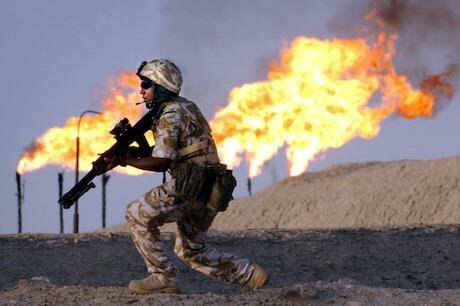 When the UK invaded, Iraq had nearly a tenth of the world's oil reserves -- and government documents "explicitly state" oil was a consideration before the war. Why didn't Chilcot explore it further? British troops carry out an evening patrol targeting smugglers at an oil plant in southern Iraq in 2003. Credit: David Cheskin / PA Archive/Press Association Images. All rights reserved. The long-awaited Chilcot Report was finally released today, examining the UK’s involvement in the Iraq War and occupation. Unfortunately, on the most important question, the report’s conclusions are all but silent: why did the UK go to war? So there was the motive; but how did the UK act on it? That same section 10.3 refers to numerous documents revealing the UK’s evolving actions to shape the structure of the Iraqi oil industry, throughout the occupation until 2009. The government did so in close coordination with BP and Shell. This full story – with its crucial context ­– was told in Fuel on the Fire: Oil and Politics in Occupied Iraq.